For a man of over 100 GP entries (and failing to qualify for a monster 31 of them) driving over half your F1 career for perennial tail-enders Osella is quite an accomplishment in itself. But then Piercarlo Ghinzani is famed for the one-liner "Better to be at the back of Formula 1 than not to be in Formula 1 at all". QED. For Osella, the man must have been a God-sent, since Piercarlo wasn't overly talented but probably the only half-decent driver to never complain and keep Osella in business for a large part of the 13 seasons in which the Osella Squadra Corse competed in F1. As with Tecno, Martini, Minardi, Coloni or Toleman, Osella came up through the ranks of F3 and F2 to try its luck in the world's top category. As with the aforementioned examples, success was scarce to non-existent. But where the likes of Tecno, Martini and Coloni gave up after a short struggle, Osella is only outdone in tenacity by Minardi. Then again, this is only when taking their years of participation into account. Putting up Osella against Minardi by its points tally or its qualification record would suggest the former team consisted entirely of madmen rather than enthusiasts. So, in the end, when Osella was taken over by Gabriele Rumi of wheel manufacturer Fondmetal - later becoming involved with Minardi before passing away in 2000 - no-one shed a tear. With Grouillard and Tarquini on board, the restructured team momentarily looked better than in all its previous years but it proved to be a false dawn. In 1998 and 1999, as a shadow of its former shadowy self, Osella made a short comeback in the second-division SR2 class of the ISRS, later redubbed SportsRacing World Cup (now FIA Sportscar Championship), supplying cars to the privateer outfit of Luigi Taverna. 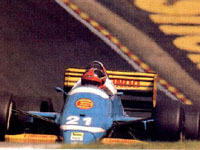 In a way, that marginal presence in motorsport felt good to Joe Pundit, for with his little BMW-engined sports racer Enzo Osella returned to his roots as a two-bit sportscar constructor - just as it was also satisfying to see that Arturo Merzario was among the drivers to take on Osella in the ISRS. Of late, Ghinzani held a similarly modest view, running his own team of BMW-powered Dallaras in the poorly supported Italian F3 championship before transferring his attention to the Euro F3000 Championship. But why should we single out Ghinzani's 1986 British GP adventure? Well, we should say because of his questionable involvement in the startline fracas that ended Jacques Laffite's F1 career. Up to Brands, F1's elder statesman of the mid-eighties had seen somewhat of a revival, taking podiums here and there, and showing the zest with which he once arrived on the GP scene, back in 1976. In fact, after several seasons of misfortune and ill-guided chassis designs (remember the disastrous design novelty of the 1983 JS21 with its peculiar sidepod configuration) prodigal son Laffite had turned Guy Ligier's team into a contender once more, the French outfit enjoying its most successful season since... well, since Laffite left the team. Fortunately for Ligier, Laffite renewing his acquaintance with Frank Williams didn't turn out such a good idea, the Frenchman totally lost near the end of the 1983 season and the 1984 season spoiled by recurrent Honda engine failure. In 1986, after a promising first season with Renault power, Laffite and Ligier were again a force to be reckoned with, the pretty and effective JS27 also giving René Arnoux's career a new lease of life. At Brands, however, it all turned sour after a poor qualifying effort by Jacques, who could not do better than 19th. It proved to be a dangerous place on the grid, for just after the lights had turned to green chaos ensued on the Brabham straight. Suddenly cars were bouncing to and from the barriers, as Laffite had made a poor getaway and made contact with Ghinzani, also collecting Berg and Danner in the process. As the leaders went round on their opening lap, the back end of the grid was left behind in bits and pieces. The red flag was out. Laffite's shattered legs were easily diagnosed and when the field came up for the restart, Jacques knew his GP career was over. But at least he had managed to beat Graham Hill's record number of GP participations just the race before, Jacques' 176 GP starts remaining an unbeatable figure before Patrese, Piquet and De Cesaris flew past.